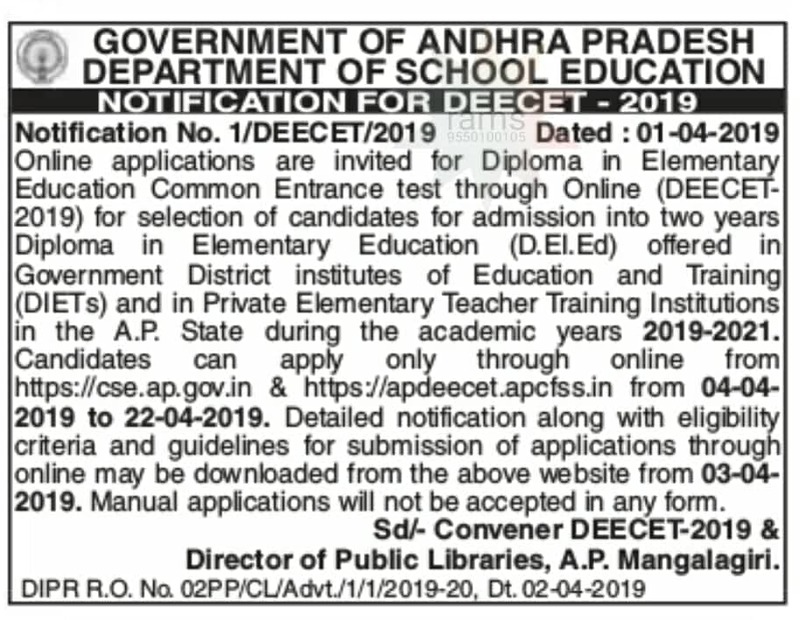 AP TTC notification 2019, Deecet (Dietcet) entrance exam : AP DEECET 2019(DIETCET) Admission Notification has been released for the academic year 2019-2020 by the Andhra Pradesh School Education Department. For DEECET 2019 Govt has released notification no.1/DEECET/2019 dt:1/04/2019. Applications are invited for AP TTC entrance exam 2019 for admission into Government District Institutes of Education and Training (DIET) and Private Elementary Training Institutions. The duration of D.El.Ed course is two years. Candidates shall pay a fee of Rs. 500/- through Payment Gateway between 03rd April 2019 to 21st April 2019. submit online application at the TTC portal from 4th April 2019 to 22nd April 2019. AP DEECET/DIETCET 2018 Timings , Fee and submission of Application Online, Procedure for submission of application online, Eligibility criteria for admission, Educational Qualifications, Storage of Examination material, Entrance exam schedule – AP DEECET-2019 are stated below. The duration of AP Diploma in Elementary Education(D.El.Ed) is two years course as per the NCTE norms. The candidates who completed two years of course will be eligible to write DSC to teach in Primary and UP Schools across Andhra Pradesh. The candidate should satisfy Local/Non-Local Status requirements as laid down in the A.P. Educational Institutions (Regulation of admission) Order 1974 as subsequently amended. Candidate should have obtained a rank in DEECET 2019 and should satisfy the eligibility criteria prescribed. The candidate who passed or appeared for the 10+2 2018-19 final Examinations (qualifying examination) or its equivalent are eligible to appear for the entrance test. But they should have passed the qualifying examination by the time of admission. The candidate should have secured 50 percent of marks in aggregate in qualifying examination. The minimum percentage of marks in the case of Scheduled Caste, Scheduled Tribe and Physically Challenged candidates shall however be 45 percent. Note : The candidates who passed Intermediate with Vocational Courses are not eligible. For admissions into two years Diploma in Elementary Education(D.EI.Ed) course online applications are invited for the Diploma in Elementary Education Common Entrance Test 2019 (DEECET). The online applications will be started from 4th April 2019 and available till 22nd April 2019. Submission of applications through online only. Aspirants who has required qualifications can apply through the online after login in the official website http://apdeecet.apcfss.in. Candidates are advised to apply online only. No written or manual application will not entertain under any circumstances. Fee details : The fee prescribed for appearing for DEECET (including examination fee ) is Rs 500/-( Rupees Two Hundred Only ) .Candidates can pay the fee through APONLINE/E-Seva centers or through payment Gateway between 03rd April 2019 to 21st April 2019. Detailed procedure for applying ONLINE is given in the Information Bulletin. Candidates can download the “Information Bulletin” free of cost from the DEECET website http://apdeecet.apcfss.in from 2nd April 2019 onwards. Candidates can submit their applications through online from 3rd April 2019. The candidate shall pay a fee of Rs.500/- through payment Gateway for submission of application. The candidate has to give the required preliminary data (i.e. Name of the candidate, Date of birth, Gender, whether the candidate belongs to A.P. and mobile phone number). On receipt of fee through gateway the candidate shall be issued a ‘Journal Number’ with which she/he can proceed with submission of application online. Issue of Journal Number does not mean that the candidate has completed submission of application online. It is only a confirmation of the fee received. Note 2: Details furnished in the application are final. Note 3: Subsequent requests for corrections will not be entertained for wrong filling of application. Paste the Photo on any white paper and Sign below(sign in BLACK INK only). Ensure that the signature is within the box. Scan the required size containing photograph and signature. Please do not scan the complete page. The entire image consisting of the photo along with the signature is required to be scanned and stored in *.jpg format on local machine. Ensure that the size of the scanned image (width=3.5 cm photo hight=4.5cm sign hight=1.5cm) is not more than 50kb.If the size of the file is more than 50kb, then adjust the settings of the scanner such as the dpi resolution, no. of colours etc., during the process of scanning. Applications with no photo/ unclear photo/ inadequate size photograph will not be accepted. Hall-Ticket will not be issued to such candidates. Hence, after pressing the ‘UPLOAD’ button below check if the photo is of required size, clear and is of the same candidate of whom the details are to be filled in the application. If the photo is smaller in size, not clear or does not belong to the candidate press ‘BACK’ button below the photograph on the application form and restart with scanning of the photograph. Complaints relating to mismatch of photograph and candidate details will not be accepted after submitting of application at any cost. The syllabus for AP DEECET 2019 entrance test examination is standard text books from VI to X . The entrance test can write in Telugu/English/Urdu mediums. The Question Paper of AP DEECET-2019 consists of 100 marks with objective questions.